How pet dogs moved from the streets to their owner’s beds, adoptions from shelters went up, and euthanasia rates went down. From large numbers of free-ranging dogs in the 70s, fast forward to today where many pet dogs sleep in their owner’s bed, and you can see how much Americans love their dogs. 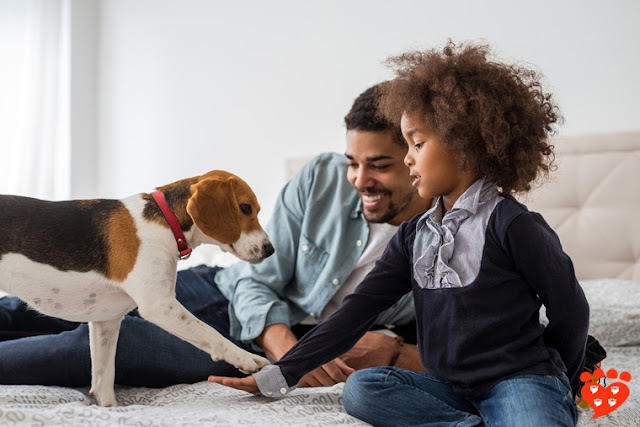 A review of the dog and shelter dog population from the early 1970s to today by Dr. Andrew Rowan (Humane Society of the United States) and Tamara Kartal (Humane Society International) charts some encouraging trends. In the 70s, an estimated 25% of dogs in the US were allowed to run free in the streets. In 1973, The HSUS estimated that 20% of America’s dogs and cats were euthanized in animal shelters. That’s 35 million dogs and cats in one year. Animals arriving at shelters were typically looked after for 3-7 days (in case they were claimed by the owner) and then euthanized. In 2010, the proportion of pet dogs euthanized by shelters each year is estimated at just below 2.5% of the dog population. 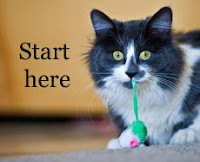 In the mid-late 70s, groups such as The HSUS, American Humane Association, and the National Animal Control Association began to campaign on responsible pet ownership. This included the idea that people should spay or neuter their pets. One factor the review identifies as important in encouraging this is the introduction of differential licensing fees that mean people who do not spay/neuter their dog have to pay more in their licence fee. 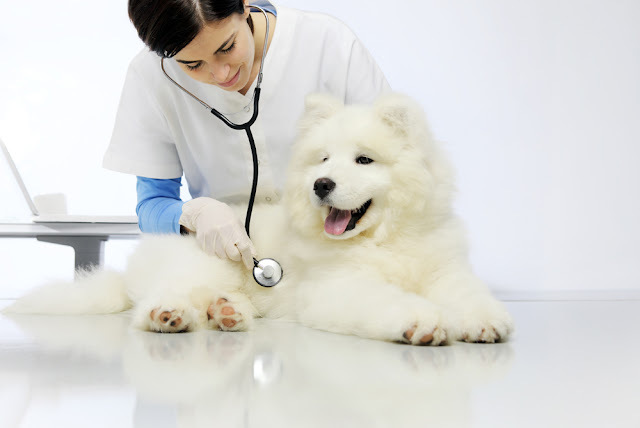 "95% of people say their pets are family members, according to a 2015 survey"
The development of clinics that offer low-cost spay/neuter surgeries is another factor in reducing the number of unwanted pets. These days, the proportion of dogs that are spayed or neutered is very high – the review says almost 100% for dogs in Los Angeles compared to just under 11% in 1971. Another big change mentioned in the report is the increased numbers of people who adopt dogs from animal shelters and rescues. 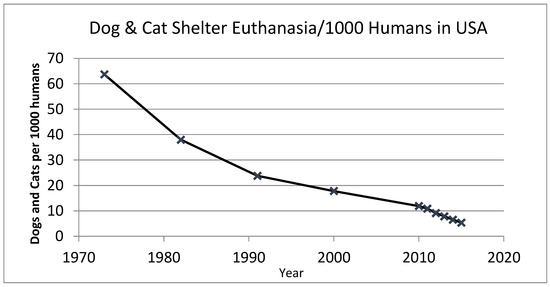 They say that from 2010 the rate of adoptions increased such that it helped to reduce euthanasia rates at shelters. A national advertising campaign that began in 2009 is credited as helping to increase the number of pet adoptions. (Incidentally, research shows that most people who adopt a shelter dog say the dog meets their expectations and that most cat and dog adopters are satisfied with their new pet). 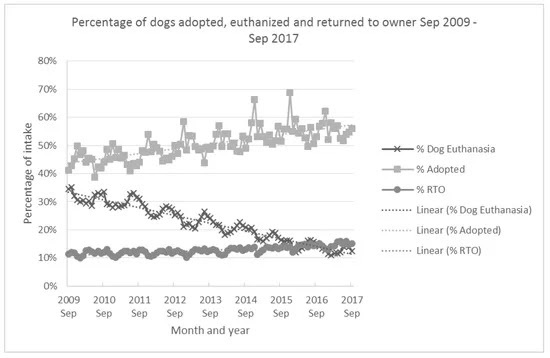 Another factor in reducing euthanasia rates, although not as big as adoptions, is the increase in shelters’ abilities to return lost pets to their owners. As more and more people get their pets microchipped, it is possible to scan dogs and contact their owners to pick them up. (However, the report does note that early competition between different microchip standards was a problem). The review also comments on people’s changing relationship with their pets, which means dogs are now increasingly thought of as family, and the amount of money spent on pets has gone up substantially. Over the past ten years, they say, people have become more likely to get a pet “purposefully” (62%) rather than “serendipitously” (26%). Ten years ago, those numbers were 46% and 37% respectively. Data shows an increase in the percentage of people saying they adopted their dog from a shelter or rescue. Reproduced from Rowan and Kartal (2018) under Creative Commons licence. 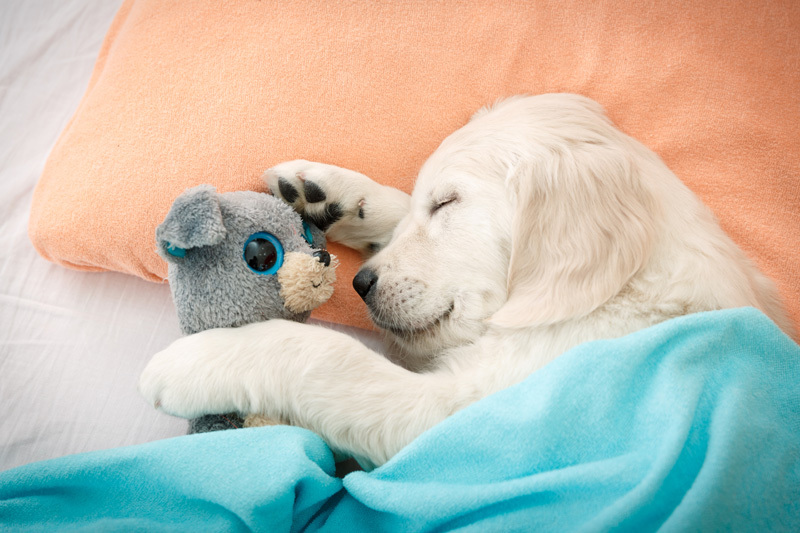 Surveys put the proportion of dogs that sleep on their owner’s bed at between about 50% and 71%. Finally, 95% of people say their pets are family members, according to a 2015 survey. 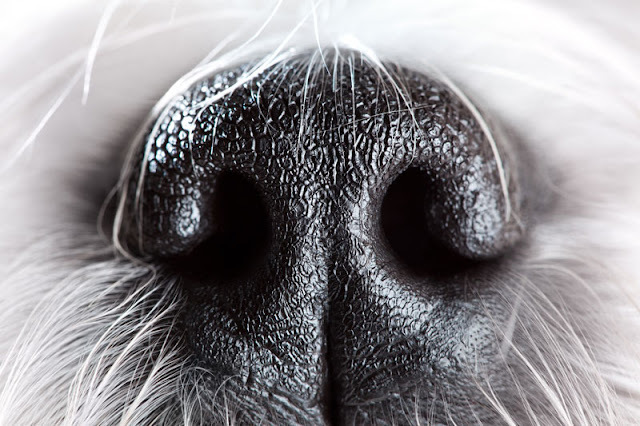 The research uses data from a variety of sources, including the American Pet Products Association, American Veterinary Medical Association, individual shelters, and software packages that some shelters use to track animals. While the data varies in time frame, quality, and reach, they have pulled it together to draw a national picture, as well as to consider some states in particular. The review suggests these lessons can provide a model for other countries, but it is important to remember that cultural factors will need to be taken into account. Even one dog or cat euthanized due to lack of a home is one too many, and so there is still a long way to go. But this review shows what has been achieved in the US in the last few decades. Let’s hope life continues to improve for our pet dogs and cats. What do you think are the biggest welfare issues for dogs today? The paper is open access (link below). Rowan, A., & Kartal, T. (2018). 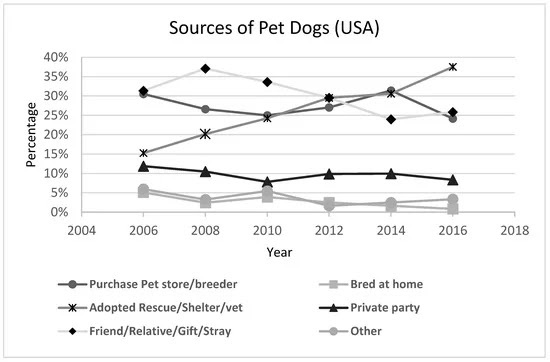 Dog population & dog sheltering trends in the United States of America. Animals, 8(5), 68. Moving from an interesting (free roaming) if dangerous life with lots of opportunities to practice normal dog behaviour (you know, the things we don’t like like running around with other dogs, chasing stuff and reproducing!) into a house deprived many dogs (unless they have an educated purposeful owner) of enrichment opportunities. The biggest welfare issue in my opinion are irresponsible breeders. What happens to the puppies they cannot sale? They are killed by the breeder, or dropped off at a shelter, then the shelter is responsible for the health spay/neuter, and adoption arrangements if so lucky. Puppy mills of course are the biggest welfare concern, but given a loop hole by way of a livestock permit. Out dated abuse, and neglect laws are another welfare issue. Healthcare is very expensive, and another welfare concern. We have many welfare issues when it comes to the marketing of animals. When their is money to be made fromthe blood, and suffering of animals.. their will be people to take advantage it.